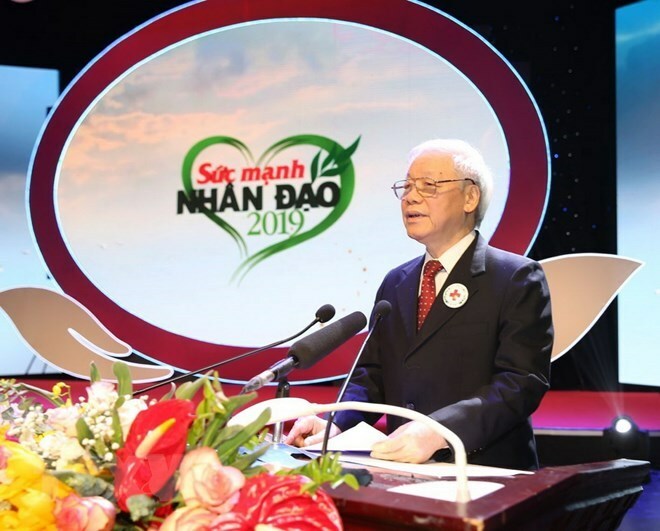 Hanoi (VNA) – Party General Secretary and President Nguyen Phu Trong called on agencies, organisations, businesses and people from all social strata to join hands in supporting disadvantaged people, while addressing an event in Hanoi on January 13. The “Strength of humanity 2019” prorgamme, themed “Tet for the poor and Agent Orange victims”, was organised by the Vietnam Red Cross Society (VRC) to call for assistance to the people with disadvantages in the upcoming Tet (Lunar New Year) holiday – the biggest annual traditional festival of the country. The leader, who is also Honorary Chairman of the VRC, said humanity is a precious tradition of Vietnam that has been passed down from generation to generation. He emphasised the VRC’s role in humanitarian activities and spoke highly of its annual “Strength of humanity” programme. Most of the poor, underprivileged and vulnerable are in mountainous, remote and disaster-prone areas, he noted, adding that the Party and State will push on with concerted economic and social solutions to help the groups improve their lives. In these efforts, the community holds a critical role, General Secretary and President Trong stressed. VRC Chairwoman Nguyen Thi Xuan Thu said the organisation, founded in 1946 by then President Ho Chi Minh, has established itself as the core and the coordinator of humanitarian activities across the country. Notably, the “Tet for the poor and Agent Orange victims” movement, launched in 1999, has so far raised nearly 6.7 trillion VND (287.5 million USD) to support over 22 million impoverished and welfare beneficial households and Agent Orange victims. Aid has been offered in various practical forms, including the provision of cash and cows, helping to build houses, and providing free medical check-up and medicine, she noted. On this occasion, the VRC Central Committee launched a text message campaign to mobilise support for less privileged people. Donors can text TET to 1407 from now to February 12 to contribute 20,000 VND per message to the fund. Notably, organisers also auctioned the ball and the jersey with the autographs of players and coaches of the national men’s football team who recently won the AFF Suzuki Cup 2018. These were the gifts from the team to Prime Minister Nguyen Xuan Phuc, who later handed them to the VRC Central Committee to auction for fundraising purposes. The result of the auction will be announced in May.